Stocking fillers often get left till last. We are all too busy buying main gifts, stocking up on food and buying all the Prosecco in sight that the stockings sometimes get left behind. If you’re on a last minute stocking filler hunt then welcome to my stocking filler gift guide for under £5. All for girls, all for under £5 and all from the same place which means you only are paying postage once. Ideal! We all need a diary so why not get this super cute Paperchase 2016 diary online with ASOS. It’s super small, super cute and SUPER sparkly. Such a useful and lovely gift. Why not make sticky notes more fun with speech bubbles. Ideal for those who loves going through a magazines and folding pages, who needs some post its for University work or even those who enjoy leaving fun notes around the house. It makes being organised fun. This is SO cool. All girls need a safe place to home their everyday rings and jewellery so why not make that place have a unicorns head? Sass and Belle are a super cool brand which I love and it’s awesome that you can purchase it through ASOS. We all need a lip balm in our lives so why not by a super large tin with mini vaselines in. I won’t lie, I once received this in my stocking and was so excited because I thought the large tin was full of vaseline… it’s not. That’s not to say it’s not a lovely gift to receive and a great stocking filler. The perfect gift for Christmas day. Opening up some Christmas socks means you can wear a fresh pair of festive socks all Christmas-day-long. These ones are really lovely and I am a fan! Meet the YouTuber brand that is pretty darn cool. These pencil cases have many uses, pencils, make up or random bits and bobs. The design is awesome and an ideal stocking filler for a blogger! I love this! A great gift for those princesses that need their morning coffee on their way to work. Having this as a stocking filler is also a great way to help that person save the pennies in the new year by bringing their own coffee and cutting out multiple daily Starbucks coffees. Do you have any stocking fillers you’re hoping Santa brings you? 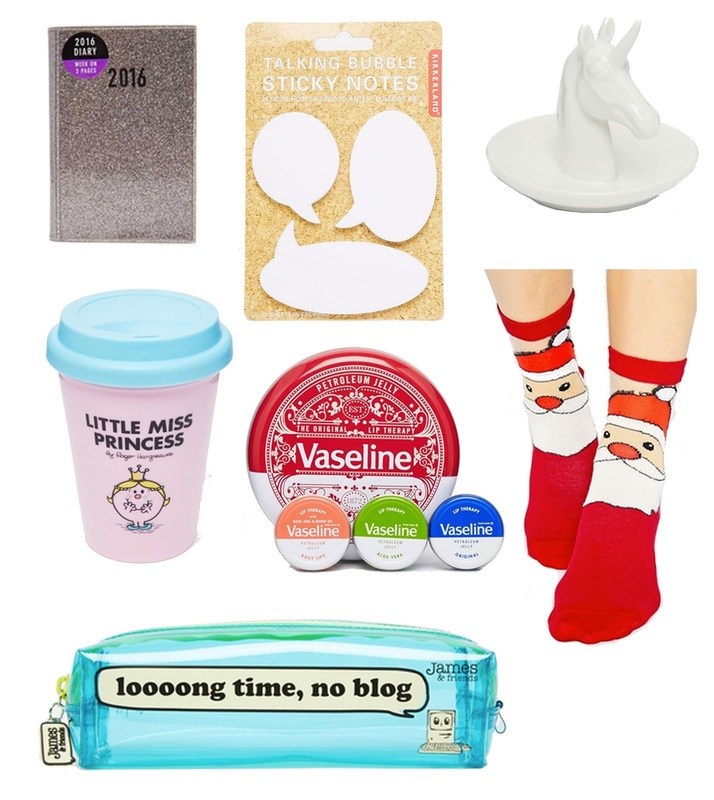 "My Favourite Festive Songs // Blogmas"
"A Festive Lipstick // Blogmas"